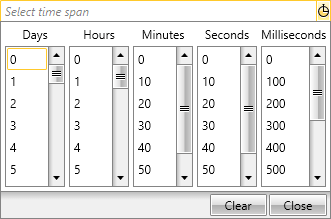 RadTimeSpanPicker provides the ability of selecting the desired time span using some of the built-in components. There are five predefined components from which you could easily choose days, hours, minutes, seconds and milliseconds. Each component can be configured - you can set some minimum and maximum range, a value step that defines the difference between two sequential selectable values. Users cannot change the ItemsSource of neither of the predefined components, because they derive from StepTimeSpanComponent, thus their ItemsSource is populated from Minimum, Maximum and Step steps and cannot be explicitly set. Also you can change the Header. DayTimeSpanComponent - a component used for picking interval of days. By design it has a minimum range set to 0 and maximum to 30 with a step set to 1. HourTimeSpanComponent - a component for picking interval of hours. Again by design the minimum range is set to 0 with step set to 1 while the maximum is set 24. MinuteTimeSpanComponent - a component used for picking interval of minutes. Has the same minimum range and maximum of 60. It has a step = 10. SecondTimeSpanComponent - represents a component for picking interval of seconds with minimum range set to 0 and maximum one set to 60 - also has a step = 10. MillisecondTimeSpanComponent - represents a component for picking interval of milliseconds. It has a maximum range set to 1000. The step has a set value of 100. Overall all components have Minimum = 0. However, their Step and Maximum vary. All five predefined TimeSpanComponents have various properties, which can be set so they could be configured in accordance with your scenario. In the following section we will go through some common properties. ItemSource - represents the collection of available items the user could choose from. Its main purpose is to populate the Items inside the TimeSpanComponents. Minimum - this is a property of type decimal that is used to define the minimum value of the selectable items in the ItemSource collection of RadTimeSpanPicker. Maximum - represents the maximum value of the selectable items in the ItemSource that the user could pick. Again, like the Minimum property it is of type decimal. Step - it defines the value steps difference between two sequential selectable values. It is used to increment each value that populate the ItemsSource collection. It is of type decimal. Header - a property of type string that represents the title of the TimeSpanComponent. If none of the built-in TimeSpanComponents satisfy your requirements you could easily create a custom one. When you create a custom TimeSpanComponent you gain the ability to change the way the items from the ItemSource collection will be represented in ticks. In order to implement the desired TimeSpanComponent you need to create a class that derives either from the TimeSpanComponentBase or the StepTimeSpanComponentBase class. GetTicksFromItem(object item)- returns a TimeSpan as ticks value corresponding to the passed item from the ItemsSource. GetSelectedIndexFromTimeSpan - returns the index of the item from the ItemsSource that should be selected for a particular TimeSpan value - is not mandatory to be overridden. 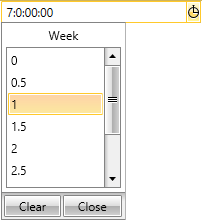 It should be overridden when the user wants to choose which item to select when the RadTimeSpanPicker.Value changes. The TimeSpanComponentBase class also contains the ItemsSource and Header properties. The StepTimeSpanComponentBase class derives from the TimeSpanComponentBase. The main difference with its base class is that it uses the Maximum, Minimum and Step properties to populate the ItemSource collection. The following example will demonstrate how to create a custom TimeSpanComponent that represents weeks. Because the TimeSpanComponentBase class derives from the Freezable class the CreateInstanceCore should always be overridden.